At long last, a new recipe post from me! 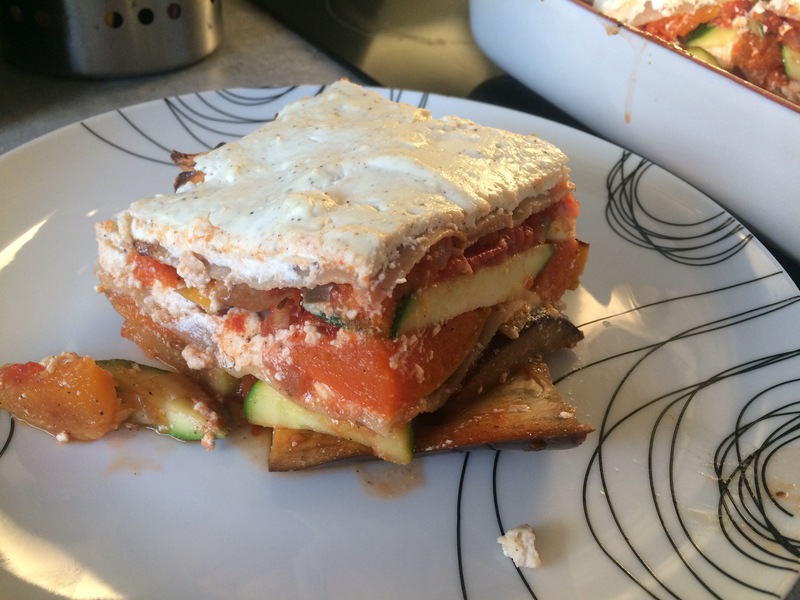 I’ve chosen this delectable vegetable lasagne as my ‘comeback recipe’ for several reasons: firstly, and most importantly, because it was seriously good! I wanted to make a vegetarian lasagne and had been browsing through a few recipes but in the end decided to just have a go and make it up myself, and I don’t like to blow my own trumpet but, boy did it turn out good! This is definitely a vegetarian dish that will satisfy both carnivores and herbivores alike. The Boyfriend was most put out that I wouldn’t let him have seconds as I was saving leftovers for dinner the following day. The second reason I’ve chosen to start with this recipe is that I feel it represents quite well hoe my cooking style has changed. I’ve had a few digestive related health issues recently and I’ve been trying to combat this with changing how I eat. I’ve been advised to avoid fatty food and I’ve also gone down a route of a lot less carbs, a lot more vegetarian dishes, a lot more fish and therefore a lot less meat and more vegetables. Too often I was feeling stuffed and bloated and heavy after meals and I was getting really really fed up with it. Now, I’m not a nutritionist and I don’t really want to jump on the ‘clean eating’ band wagon as this can lead to a lot of misdirection and people taking bad advice as gospel. I’m just cooking food that makes me feel better and that works for my family. There will still be carbs and meat and sugar involved in my recipes, I’m not cutting anything out, just being more conscious of how, when and how much I use/eat these things. This shake up in our diets has resulted in a lot more experimenting and getting a lot more creative in order to make vegetables more satisfying and varied so that everyone doesn’t get bored with it. We have particularly enjoyed baking lots of tasty vegetable cakes! But enough about my diet and bake to this luscious lasagne! The size of my dish makes six reasonable portions, which is ideal for me since there are three of us. I make the lasagne on a Sunday and serve up the remaining three portions for a quick and easy dinner on Monday. Leftover portions can also be easily frozen for a rainy day or make ideal packed lunches to reheat in the office and make all your colleagues jealous the next day. 2. Spread squash and turnip pieces on. Baking tray, drizzle lightly with sunflower oil and season with slat and pepper. Bake for 30 minutes until cooked. Leave the oven on when they’re done. 3. Heat a little more oil in a saucepan and gently sauté the onions, when soften add the garlic and cook for a further minute. 4. Add the chillies, dried herbs and tomato purée, cook out for a further couple of minutes. 5. Pour in the tomatoes and water and bring to the boil. Season with salt and pepper, cover and gently simmer for 10 minutes. Stir through the fresh herbs. 6. Meanwhile in a mixing bowl throughly combine the ricotta and cottage cheese. Mix in the nutmeg and season with salt and pepper. 7. Assemble the lasagne by first laying in the vegetables, evenly spreading the cooked turnip and squash as well as the raw aubergine and courgette. Pour over a couple of ladles of tomato sauce remembering to reserve some for further layers. Cover with lasagne sheets and spread the cheese mixture on top of the dried pasta. Repeat these layers until everything is used up making sure you finish off with cheese. 8. Bake for 30 minutes. Allow to cool before serving.